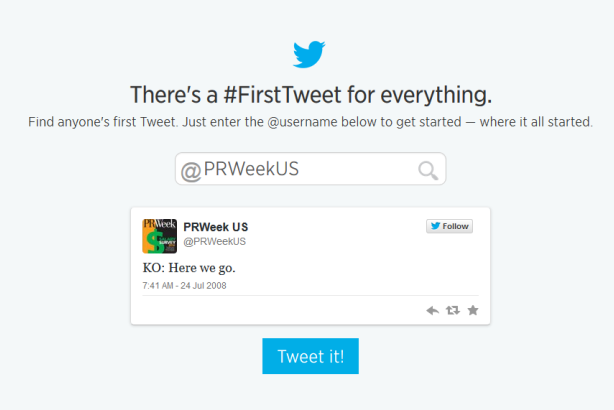 Twitter will celebrate its eighth birthday on Friday by launching a #FirstTweet tool that enables users to look up anyone's first tweet. SAN FRANCISCO: Twitter will celebrate its eighth birthday on Friday by launching a #FirstTweet tool that enables users to look up anyone’s first tweet. In a blog post, Lewis Wiltshire, Twitter UK’s director of media partnerships, reflected on the development of the social media site in the eight years since its launch. He linked to a custom timeline with numerous examples of celebrities’ first tweets. Piers Morgan tweeted: "BREAKING NEWS: I'm now a Twit. Official" on November 30, 2010. Twitter founder Jack Dorsey posted on March 21, 2006: "just setting up my twttr," a reference to his own account and the birth of the social media site. Writing about Twitter's eighth anniversary, Wiltshire said in his blog post that "since 2006, millions of prolific tweeters across the UK and beyond have made Twitter an exciting, fun, and powerful place to connect with others. More than 500 million Tweets are now being sent every day and more than 240 million of you are active on Twitter across the globe." He added, "But everyone has to start somewhere, and today we’re taking a look at some choice first Tweets. It’s a selection of messages that have sparked conversations, told great stories, showed something new, or simply made someone smile."